If youre tired of wasting money and energy on drafty old windows, youve probably considered replacing them. But how to go about it? While replacing windows can be a DIY project, it isnt a particularly easy one. A single window can cost you around $500 and half a days work to replace, and youll need some significant home remodeling or carpentry experience to do it right. But if the windows in question are on the ground floor and youre willing to test your skill set, here is how you can go about it. The first step will always be measuring the window for a replacement. This is the most important aspect of the job, so make sure you take your time and double or triple check your math before you order those costly replacements. First measure the inside width of the existing frame, across the top, the center and the bottom. Jot down the smallest of those measurements on a sketch that pictures the approximate shape of the window so there will be no surprises. Also measure the height of the frame, from the underside of the head jamb up to the top of the sill. Take three measurements there and again write down the smallest. Measure the frame at each diagonal to make sure it is square. If two diagonal measurements are equal, or only off by an eighth of an inch youre fine to go ahead. If its more than that, you may need to replace the frame. Once the measurements are complete, pry off the upper and lower sashes. Take your time with this, as you may want to reuse them and they can easily break. Next youll need to pry out the jamb liners. Make sure there arent any leftover wooden stops, and try to keep the casings both inside and outside the frame in one piece. The last steps to preparing the frame is to scrape off any noticeable paint chips, and patch any cracks or holes with wood putty; sand it smooth, and then prime and paint all surfaces. Now its time to prep for the insulation. This is a key step, especially if your renovation was due to drafty windows. Use polyurethane foam, or any other low pressure foam meant for use in doors or windows. If the type you use expands as it cures (as with the cans available in home improvement stores), go lightly. As it expands it can cause undue pressure and warp wood. Pull out any fiberglass that might be sitting in the weight pockets, then bore holes in the end and center of the head jamb and sill, each one approximately 3/8 of an inch in diameter. Spray the foam into the holes until it is filled, and into the sash-weight pockets of each side jamb. Let it harden for half a day before removing the excess and replacing the sash-weight pocket panels. The process of being so meticulous with insulation is called creating a tight envelope. With older homes this was not much of an issue but with todayhigh and going-higher-still energy bills, its the only way to go. At this point, youre about ready to install the actual windows. Lay a line of caulk on the inner side of the exterior casings, and along the windowsill. Once thats up, lay the window in the frame. Work on the interior, starting by laying the bottom of the window in place, then tipping it up and tight against the exterior casings. Once you see that it fits snugly, just drive a single screw into the top of the side jamb and the frame. Lock the sash in place, and use shims under the sill to center the window and ensure that all the hardware works correctly. When you have it where you want it, then drill in the rest of the screws. Now head outside to finish the job. 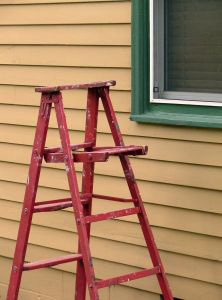 Any gaps between the window and the frame that are one quarter of an inch or smaller can be filled with caulk. Anything larger youll fill with backer rod. Now youre ready to put the stops back up, and paint the window to match the rest of the house. Finish it off with the highest rated vertical blinds you can find, and youve got one window taken care of. If youre still undaunted by the work, head to the next window and try it all again! Do you have any tips on replacing old windows not covered here? Why not share them with our readers in the comment section below?